Today, Mohawk College faculty, staff, and volunteers are welcoming you to the Mohawk College Open House at the Fennell campus! This is a great opportunity to discover the wide selection of certificates, diplomas, degrees and apprenticeships programs offered at Mohawk College, and to explore the recently renovated Fennell campus. You can meet with faculty and staff who can provide valuable information about programs, admission requirements, and what to expect from campus life. Our friendly library staff will be available to share the services that you can access at your campus library. The Open House will run from 10:00 a.m. to 1:00 p.m. at the Fennell campus. For maps and directions, please click here. In recognition of World AIDS Day (December 1, 2014) the AIDS Network, in partnership with Mohawk College’s positive space, Social Inc., presents the movie “The Normal Heart.” This community event will take place on Thursday, November 27th, from 10:00 a.m. to 1:00 p.m. in the McIntyre Performing Arts Centre at the Fennell campus. The movie stars Jim Parsons, Julia Roberts and Mark Ruffalo, and deals with the emerging AIDS crisis during the 1980s. A panel discussion will take place following the film. The AIDS Network will also be hosting an Open House on Monday, November 24th, from 3:00 p.m. to 5:00 p.m. to celebrate HIV/AIDS Awareness week. Guests are invited to meet staff and learn more about the programs and services for people living with, affected by and vulnerable to HIV and hepatitis C.
Mohawk College Library has a variety of resources that can help you learn more about HIV/AIDS. The book HIV/AIDS: A very short introduction includes information about the emergence of the epidemic, scientific responses, and its impact on the world. 100 questions & answers about HIV and AIDS answers the most commonly asked questions about HIV and AIDS including: diagnosis, treatment, post-treatment quality of life, alternative medicine, targeted therapy, and coping strategies. The series HIV/AIDS: Real people, true stories is available through the online video database Films On Demand. The videos dispel myths about HIV/AIDS, explain how HIV is acquired and how it can be prevented, and discusses the physical, psychological, and social effects of being HIV-positive. From the website CATIE: Canada’s source for HIV and hepatitis C information. This evening, Mohawk College faculty, staff, and volunteers are welcoming you to the Mohawk College Open House at the Stoney Creek campus! This is a great opportunity to discover the many different skilled trades and apprenticeship programs offered at Mohawk College, and to explore the recently renovated Stoney Creek campus. You can meet with faculty and staff who can provide valuable information about programs, admission requirements, and what to expect from campus life. Our friendly library staff will be available to share the services that you can access at your campus library. The Open House will run from 5:30 p.m. to 8:30 p.m. at the Stoney Creek campus. For maps and directions, please click here. Today, Mohawk College faculty, staff, and volunteers are welcoming you to the Mohawk College Open House at the Institute for Applied Health Sciences building! This is a great opportunity to discover the many different health sciences programs offered at Mohawk College, and to explore the Institute for Applied Health Sciences building. You can meet with faculty and staff who can provide valuable information about programs, admission requirements, and what to expect from campus life. Our friendly library staff will be available to share the services that you can access at your campus library. The Open House will run from 9:30 a.m. to 12:30 p.m. at the Institute for Applied Health Sciences building, located on the McMaster University campus. For maps and directions, please click here. Welcome back Mohawk College students! Mohawk College Library welcomes back all returning students, and invites all new students to drop by our campus libraries! We hope that you have enjoyed your summer break, and are ready for another school year. Whether it is your first semester, or your last, the beginning of a new semester is very exciting! Speaking of excitement…Mohawk College invites you to learn all about the services available to students, and have a little fun while you do! Student Engagement & Employment has been working hard to organize Orientation Events at each campus location. Speaking of getting social…the library is hosting its very own social event! Students can pick-up a “book card” from the library table at the President’s Welcome at the Fennell campus, on Tuesday, September 2nd, or at any library location. Library staff will be available to help you. We have saved the best for last! Once you are done, have some fun in our photo booth! Take a selfie, or a group shot, and remember to get creative! The photo booth will be available from 11 a.m. to 2 p.m. from September 2nd to 4th. 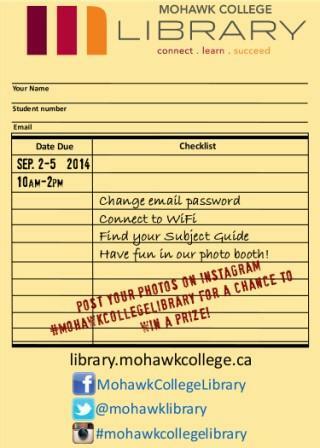 Once you’ve taken your photo, post it to Instagram, and include #mohawkcollegelibrary. After you have completed each of the steps, you can enter a draw to win a prize, and the best Instagram photo also wins! So, join in the fun at your Mohawk College Library location; we are looking forward to seeing your smile! This has been a great summer; the weather has been perfect. I am sure that most of you are not thinking about the upcoming school year quite yet but, it will come faster than you think. Why not take some time to get a head start on learning how to have a successful college experience? Mohawk College is offering two more Start Smart orientation sessions this summer, July 24 and August 28, 2014. These sessions provide information on eLearn navigation, study skills, financial planning, and more. Plus, as an added bonus, there is a free BBQ and a tour of the college so you won’t get lost on your first day – been there, done that! Registration for Start Smart can be found here. The Mohawk College Library has a number of subject guides to help you succeed with your assignments. We have compiled information on writing, math, computer skills and more. Check them out! You are currently browsing the archives for the campus events category.